POMPANO BEACH, FL -- Cheering and whistle blowing filled the coast of Pompano Beach on Saturday as approximately 300 boats watched Lady Luck sink on Saturday afternoon. "I think it went down just the way that we wanted," said Dennis MacDonald, the artist of the underwater casino. "It was incredibly beautiful." The underwater attraction sank about two hours later than expected. South Florida Divers sent a team of 12 divers into the water immediately after the sinking to verify the former tanker's location. Tom DiGiorgio, the chairman of the Economic Development Council of Pompano Beach, said that the divers plan to signal Broward County officials and coast guards that will allow more than 250 divers to go down and see Lady Luck. Divers returned hours later without being able to see much of the underwater casino. 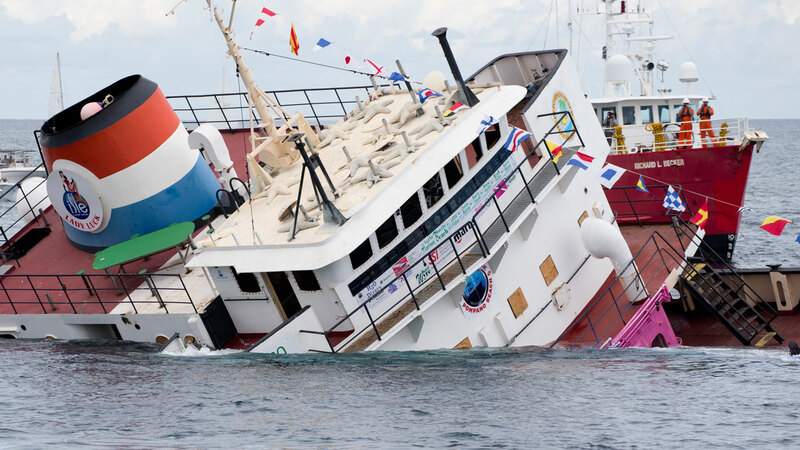 "The visibility is very bad and there was a lot of stuff coming out of the ship," said Jeff Torode, owner of South Florida Diving Headquarters. Torode, one of the first divers to see the shipwreck from underwater, also said that although it was hard to find the shipwreck because of poor visibility, he was able to see the white Isle Casino Racing sign located on the top deck. John Chatterton, who was tasked with dropping the hatches after the sinking, said that the shipwreck settled upright. Chatterton also said that after a few days, divers will be able to enjoy the shipwreck and marine life. "The sharks and the art that was added are going to take on an entirely different appearance," Chatterton added. "There are lots of ships that are sunk," DiGiorgio said, "but this will be the only one that is truly interactive and with artwork on it." As one of the most accessible major dive sites in the nation, Lady Luck is expected to lure approximately 35,000 divers each year. DiGiorgio said that after a 10-year search for the right vessel, Pompano Beach has finally found an economic engine for Florida's tourism industry. "It's going to help the hotels, the restaurants and the ancillary effect is going to ripple out for years to come," said DiGiorgio. The 324-foot tanker was built in 1967 and was towed from New York to Florida earlier this year. It was lowered off Pompano Beach on Saturday afternoon. It features three larger-than-life shark statues, a life-sized mermaid and an interactive art exhibit that will display locally produced underwater artwork. MacDonald says he hopes his design will attract tourists and marine life - and will contribute to Florida's artificial reef system. Divers have the ability to swim up to card-slinging octopuses, fake slot machines and poker tables immediately after the ship was sunk. Lady Luck includes 16 staterooms, a captain's deck and an interactive art exhibit with a rotating gallery display of locally produced underwater artwork. Shipwreck Park chairman Greg Harrison said that the funding for the creation of the artificial reef was split between the city of Pompano Beach and Pompano Beach Isle Casino. The attraction will be free for certified divers with their own boats. MacDonald said that with the help of about five people, including his wife, it took roughly two months to finish. MacDonald also said that some of the pieces used to create the slot machines were salvaged from inside of the tanker. "As the ship was stripped, I took valves and springs," said MacDonald. "It was kind of a nice rebirth and reutilization of general parts of the ship." Rob Wyre, the general manager of Pompano Beach Isle Casino and Raceway, was one of the people that oversaw the final preparation stages on Friday before the wreck sank. Holes were strategically cut into the wreck and pre-filled with water so that the artificial reef would only need a little more water to sink the next day. Wyre also said that several ideas for the theme of the underwater attraction, such as a replica of Florida, were proposed but MacDonald thought that an underwater casino would be the best fit. The wreck has the potential of becoming one of the biggest contributions to Florida's artificial reef system. It will allow for new coral growth by minimizing damage created by divers and marine life.